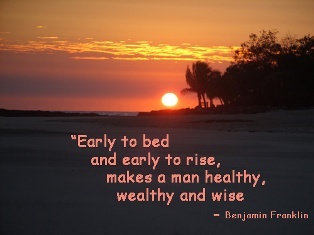 As anyone that knows me will attest, I have always been a keen follower of the doctrine “early to bed, early to rise”. Whenever I can, I am usually in bed by 8pm. Apparently, medical research is starting to catch up with this ancient wisdom. In a recent study, reported in the Journal of the American Medical Association, sleep-deprived people had 4.5 times the risk of heart disease — and that’s after researchers subtracted out the effects of other known coronary risk factors, such as high cholesterol, high blood pressure, diabetes and smoking.